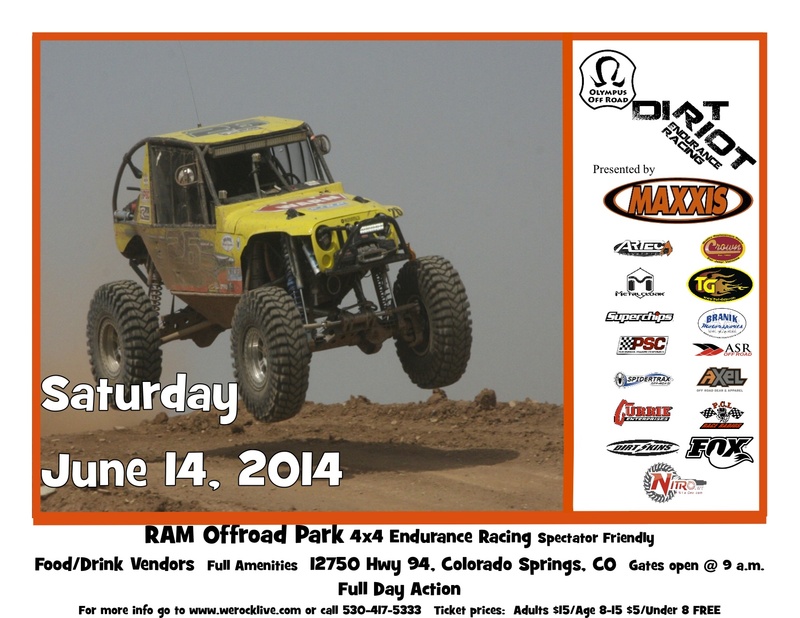 Tech and Registration will be onsite at RAM Offroad Park on Friday. A Driver Meet & Greet will be at Southside Johnny’s in downtown Colorado Springs on Friday night, vehicles not mandatory. The Pro 4400 4×4 class is already loaded with fast drivers that are pre-registered to race at this event including Bent & Twisted Racing Billy Briney, Rock Junkies John David, Rock Addicts Racing Chris Hoyt, Lovell Racing Roger Lovell, Bent and Twisted Racing Mike McClure, Black & Blue Racing Todd Seawell, Rock Addicts Racing Hunter Sparrow, Home Grown Racing Ben Swain, Rock Addicts Racing Chad Wheeler, Campbell Racing Bailey Campbell, Ellett Racing Clint Ellett and Kyle Roach. Pro 4500 4×4 pre-registered teams include Muddnutt racing Kevin Rants, Mitch Funk, Jeff Rector and Russ Rose. Pro 4600 4×4 pre-registered teams include Rock Ware Motorsports Matt Peterson and Letzroll Offroad Racing Matt Salyers. UTV’s always have a ton of fun on this track, and there are already a half dozen pre-registered including RAM Off-Road Racing Shane Chiddix, Red Fish Racing Brian Fisher, Andrew Godfrey, Justin Meader and Shelly Pavlu. Many more are scheduled to attend, and you are also welcome to join. With only some simple safety requirements, anyone is welcome to come and race! Spectators are encouraged to come and enjoy the day of entertainment on Saturday June 14th. Admission is $15 for adults, $5 for ages 8-15, children 7 and under free and Military with ID get $5 off. There are vendors, food and amenities on site, and we encourage you to bring chairs and shade structures. For additional details go http://www.werocklive.com/2014/dirt-riot-mountain-round-2-colorado-springs-co.
After the event we will have the results, pictures and stories posted at http://www.werocklive.com/2014/dirt-riot-mountain-round-2-colorado-springs-co.